What Is a Good Length for a Lunge Line? A lunge line is similar to a lead rope except for its length. It is used to exercise or train a horse from a distance, with the buckle end attached to the bridle, cavesson or halter, and the other end in the hand of the trainer. Most lunge lines are made of nylon or webbing, but others are made of rope. Most lunge line exercises require the horse to track right or left in a circle. A small circle puts stress on the horse's joints, tendons and ligaments, especially at faster gaits. The horse's outside legs must work harder and reach farther than his inside legs, which also can lead to poor balance. To ensure your horse's safety, work with a lunge line at least 33 feet long. Consider any factors that might decrease the length of the line. Some riders, for example, thread the line through the bit loop on the inside, stretch it over the horse's ears and clip it to the outside bit loop to prevent the lunge line from pulling the bit through the horse's mouth. If you use this technique, consider working with a longer lunge line. A longer lunge line ensures your horse's safety because it increases the diameter of the circle. If your lunge line length exceeds 35 feet, however, you risk losing control of the horse. You can coil the end of the lunge line in your hands to shorten it, but you risk catching your thumb or finger in the loops if your horse bolts. Always lunge with gloves to avoid sustaining rope burn. If your lunge line is too long, loop the excess into a neat coil that you can release easily. Hold the coil in your left hand and the main line in your right. The lunge line also is effective when working with a horse-and-rider pair. The rider can focus on her seat and legs without worrying about her reins. 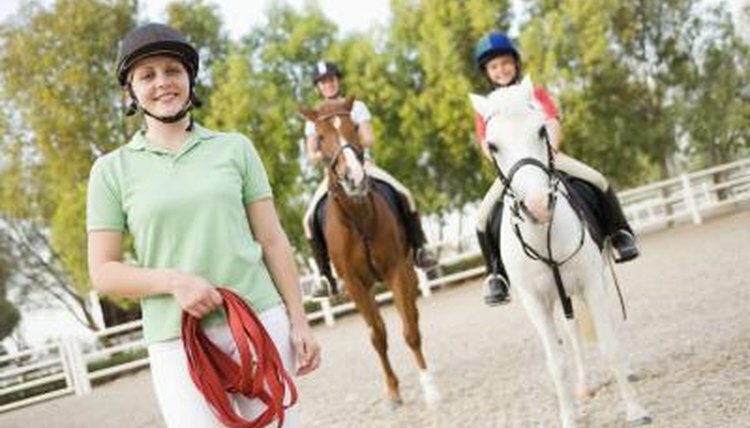 When working with a rider on horseback, extend the lunge line to at least 36 feet. A larger circle ensures the rider can stay balanced in the saddle. The only exception is when working with beginner riders at the walk and trot. Smaller circles in these circumstances will give you more control so the rider feels secure. If you have access only to a shorter lunge line, walk a circle in the center of the arena so your horse will cover more ground. Lunge in a round pen so your horse will still maintain an even, balanced circle. Alternatively, set up traffic cones or other markers in the center of an arena to serve as the boundaries of your lunging circle. What Are the Leg Movements That Are Used to Control a Horse?